Railcar Unloaders – Foremost Machine Builders, Inc. The Foremost Railroad Car Unloader is a complete, self-contained material conveying system operating on a vacuum/pressure continuous loading principle which offers the advantages of continuous material flow at high rates over substantial distances. 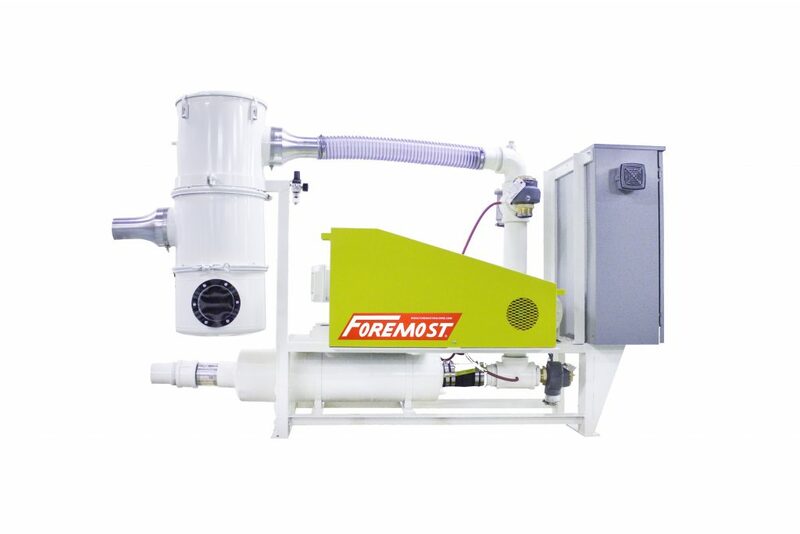 Continuous material flow not only insures maximum efficiency from the blower unit, but also eliminates any potential clogging which might occur (particularly at the bottom of long vertical lines) by intermittently starting and stopping the material flow as in a batching vacuum system. The Unloader utilizes a single positive displacement blower (as standard, or an optional dual blower arrangement if required) to create the vacuum as well as generate the positive pressure conveying air flow. The blower is protected from material entrance on the discharge side by a check valve. Further protection is afforded by using both vacuum and pressure relief valves. Critical functions are monitored by gauges. The single material receiver/ air filter features automatic, continuous filter element cleaning. Material build-up on the elements is monitored by a gauge. The rotary valve under the receiver is chain driven by a fractional horsepower gearmotor. 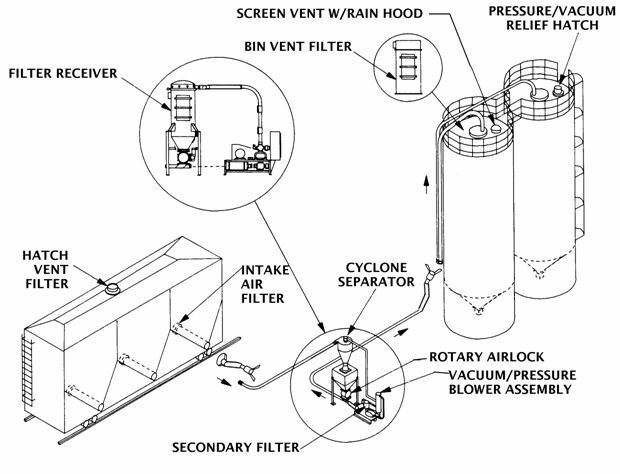 In some applications the Filter receiver can be replaced with a cyclone transfer station.